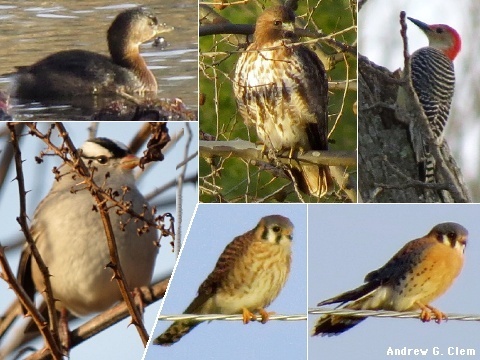 On Saturday December 19, the Augusta County Christmas Bird Count was held with a total of ten teams out in the field. The weather was less than ideal with starting temperatures at a cool 21, eventually rising to 42 degrees, and strong winds which kept many of the birds hunkered down and out of view. Altogether we managed to find 76 species plus four more during the count week. The rain on Thursday and winds on Friday resulted in a good assortment of waterfowl on the count day. My team started at 5 A.M. and we managed to find 3 species of owls, with a total of 62 species for the day. When Gabriel Mapel got home from the Rockingham CBC he managed to add a Great Horned Owl to our list, bringing our total to 76 species. Below are some of the most notable birds that were found. The final tally from the Waynesboro Christmas Bird Count, supervised by Crista Cabe, is still pending. There were many amazing sightings at the 2015 Rockfish Gap Hawk Watch, which has come to an end for this year. On multiple days, all three "regular" falcon species -- American Kestrel, Peregrine Falcon, and Merlin -- have been seen. As of December 1, 10,497 Broad-winged Hawks, 1,497 Sharp-shinned Hawks, and 246 Bald Eagles have been recorded. Among the various "oddities" observed, a leucistic (partially white) Turkey Vulture was seen and photographed by Brenda Tekin in late October. 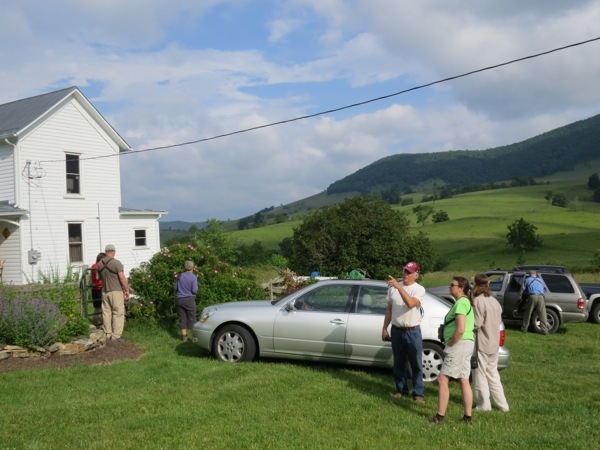 September 20 was a busy day at the Hawk Watch at the Afton Inn. 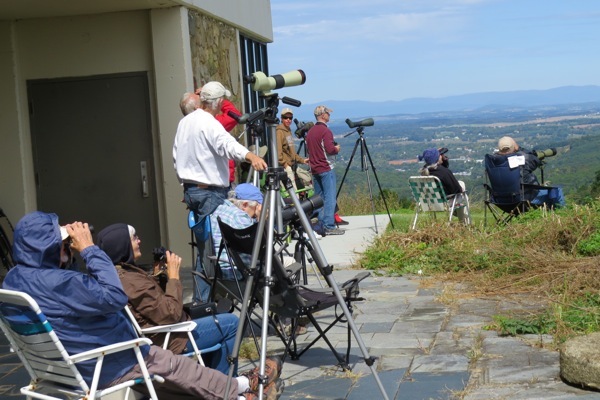 Once again, we have had pretty good coverage by volunteers at the hawk watch at the Afton Inn at the scenic Rockfish Gap, just east of Waynesboro. Brenda Tekin, Dave Hunter, Rose Thomas, Vic Laubach, and Gabriel Mapel are among the regular observers up there. At latest count, 10,328 Broad-winged Hawks, 405 Sharp-shinned Hawks, and 180 Ospreys, among many others, have passed through during this migration season. If you haven't been up there to see a Merlin suddenly zoom past out of nowhere, you don't know what you're missing! 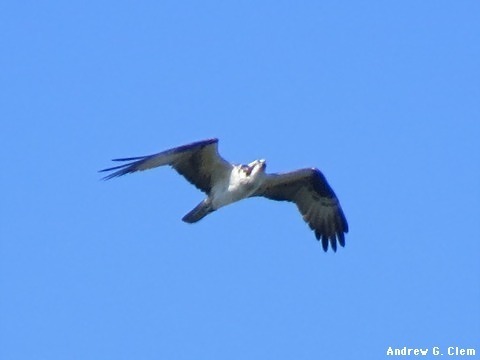 Osprey, passing over Rockfish Gap, September 19, 2015. For more information, see the Rockfish Gap Hawk Watch Web site. Due to steady rains, this year's open house scheduled for Saturday, September 12th was canceled. Besides all the raptors, we have been getting a fair number of passerine migrants as well. Distinguishing the "confusing fall warblers" from each other can be a challenge, but sometimes there's no doubt about it. Tennessee Warbler, on top of Shenandoah Mountain south of the Confederate Breastworks, September 17, 2015. Among the unusual migrating shorebirds seen in this area last month were a Wilson's Phalarope, a Stilt Sandpiper, and a Baird's Sandpiper, all in the Stuarts Draft area. 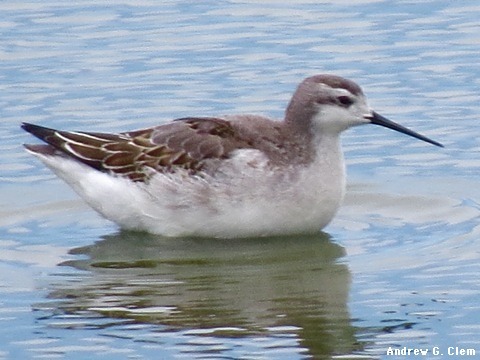 Wilson's Phalarope, at Lake Andes NWR, South Dakota, July 30, 2015. 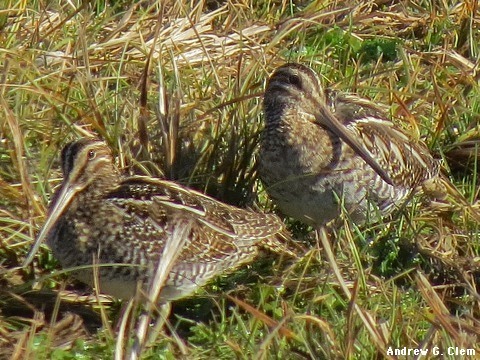 All in all, it was a wonderful day of birding in Highland. All of us thanked Allen for arranging and for leading, and for sharing his great birding skills! Field trip participants were graciously welcomed by the O'Bryans to their home in Highland County. 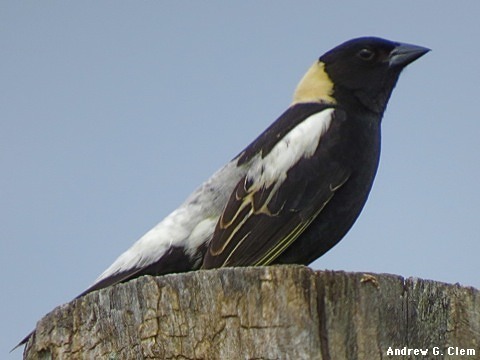 Bobolink (male), west of Blue Grass, VA, June 13, 2015. 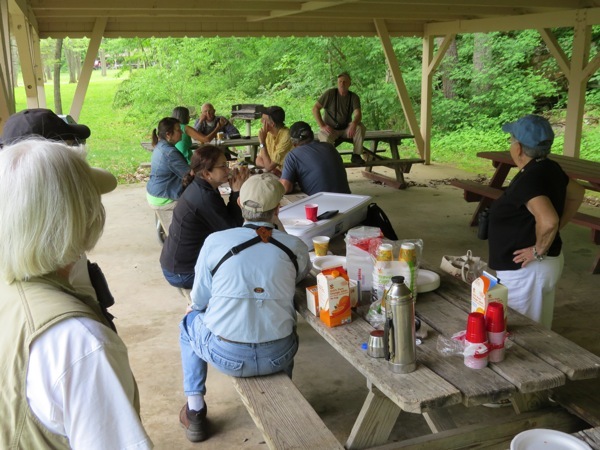 On Saturday, May 16, the Augusta Bird Club held its annual "Birding & Brunch" picnic at the Natural Chimneys Regional Park in Mount Solon. The group birded for an hour or so and then gathered for food and conversation. Among the highlights from the brief walk was: Yellow-throated Vireo, Great Crested Flycatcher, Blue-gray Gnatcatcher, Pine Warbler, and Blackpoll Warbler. ABC picnic at Natural Chimneys. Yellow-throated Vireo in a tree top at Natural Chimneys. During the first half of May, club President Penny Warren has been leading walks on Bells Lane to see what spring migration might bring. 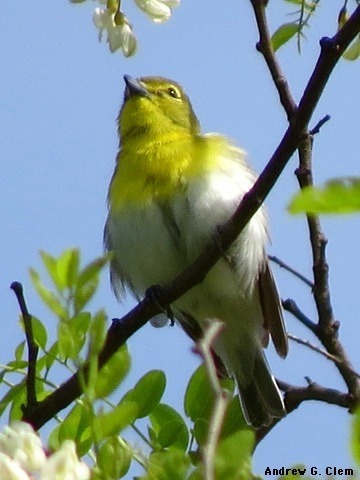 Among the highlights from these field trips have been: Yellow-billed Cuckoo, Willow Flycatcher, Great Crested Flycatcher, Scarlet Tanager, Orchard Oriole, Baltimore Oriole, Black-throated Blue Warbler, Black-throated Green Warbler, Magnolia Warbler, Chestnut-sided Warbler, and Blackpoll Warbler. 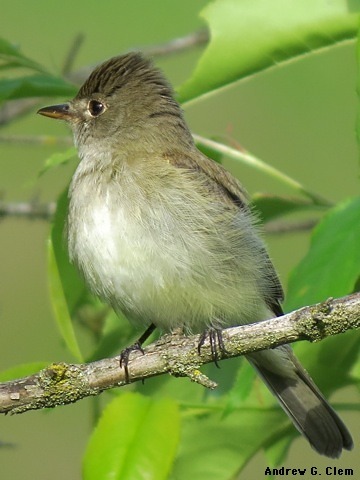 Willow Flycatcher, on Bell's Lane, May 15, 2015. Once again, Augusta Bird Club Conservation Committee Chairman Darrell Schwalm is helping to organize events for Earth Day in our area. The main event will be Earth Day Staunton Expo on Saturday, April 18, from 9 a.m. until noon, in downtown Staunton at the Sunspots Pavilion on Byers Street. The Expo features family-oriented conservation oriented exhibits and entertainment. The Augusta Bird Club will have an exhibit table at which children can make their own pine cone / peanut butter bird feeders. In addition, on Wednesday, April 22, John Spahr will do a presentation on "Owls: Birds of Mystery and Majesty," at 7:30 p.m. in the Staunton Public Library. The presentation, sponsored by the Augusta Bird Club, will explore man's association with owls, as well as some of the unique anatomic and behavioral aspects of these curious birds. For information on all the other Earth Day events taking place, see earthdaystaunton.org. Local photographer Marshall Faintich recently paid a visit to Waynesboro and nearby areas, and captured some vivid images of nature at its best. For more photos taken that day, see Marshall's blog, symbolicmessengers.com. 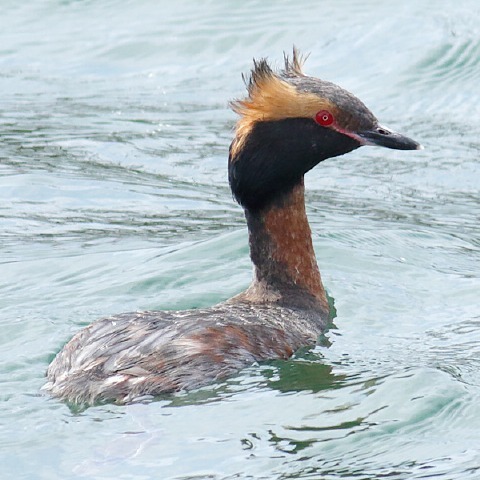 Horned Grebe, April 9, 2015. Courtesy of Marshall Faintich. 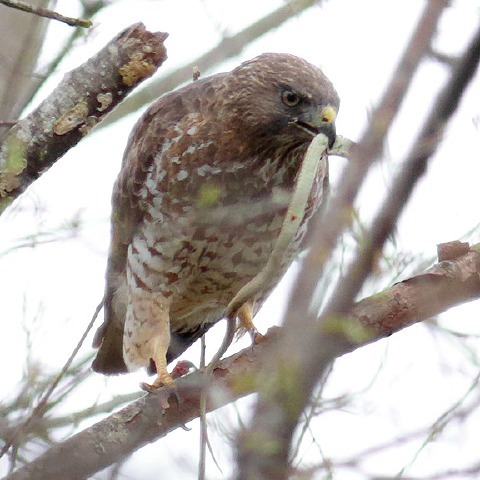 Broad-winged Hawk eating a snake, April 9, 2015. Courtesy of Marshall Faintich. At the March 9 meeting, Justin Folks of the Virginia Department of Games and Inland Fisheries (DGIF) spoke about the state's Bobwhite restoration program. The population of Bobwhites in much of the United States declined drastically during the latter part of the 20th Century, as more and more rural land was developed, thus depriving the ground-nesting birds of their special habitat requirements. DGIF officials are working with landowners to encourage more natural landscaping, with the right kind of vegetative cover for the birds. For more information, see dgif.virginia.gov/quail/ or bringbackbobwhites.org. 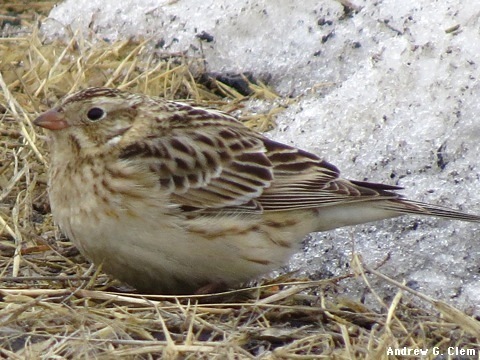 Photographs taken by Marshall Faintich, Brenda Tekin, and others leave no doubt that it was indeed a Smith's Longspur that appeared (along with some Lapland Longspurs) at the Shenandoah Valley Regional Airport during the last week of February. 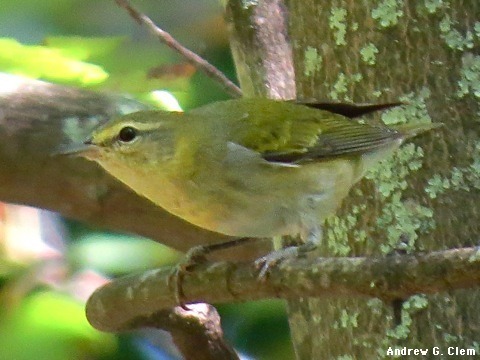 It was the first-ever confirmed observation of this bird species in the state of Virginia. For more on this great find by Marshall, including many detailed photos, see symbolicmessengers.com. Also see Brenda Tekin's photo-report, identifying all the key field marks, at smugmug.com. Smith's Longspur, by the road into Shenandoah Valley Regional Airport in Weyers Cave, February 26. 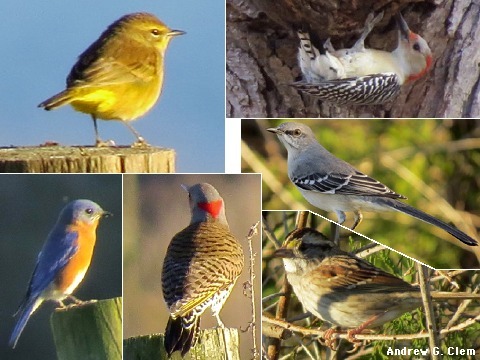 This year's Great Backyard Bird Count was held on February 13th-16th. In preparation for the event, Augusta Bird Club members held a public field trip at the Frontier Culture Museum, and an evening session on bird identification at the Staunton Public Library. Eventually we hope to have more information on how many people in our area participated, and the numbers of species counted. At the February 9 meeting, Calvin Jordan Virginia Dept. of Environmental Quality spoke to the club about the South River mercury project. In the 1970s it was discovered mercury was in the South River and the fish were too contaminated to eat. In 2005 was it discovered that mercury was also in the nearby terrestrial environment, affecting birds and mammals of prey. Continued monitoring will be necessary to assess the long-term effects of the industrial pollution. 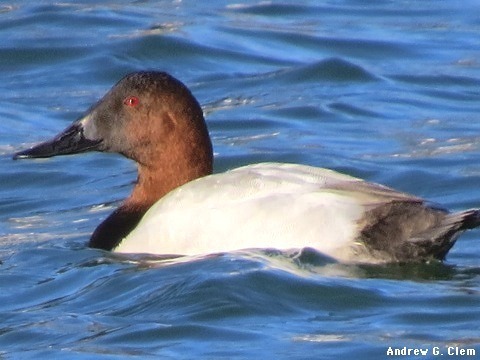 Male Canvasback, on the pond near Eagles Nest Airport in Waynesboro, January 1.